Fully-hardy, evergreen conical or columnar tree with thick, fibrous, red-brown bark, narrowly wedge-shaped, forward-pointing leaves, to 1.5cm long, in 5-ranked spirals around the shoots, and solitary, spherical female cones, to 3cm long. To 25m. The timber is white, compact, fibrous and highly prized in Japan and Northern China [RHSE, Hortus, Hilliers']. See also Cryptomeria japonica D.Don var. lobbii. Introduced to Britain in 1844 by Robert Fortune. [JD]. 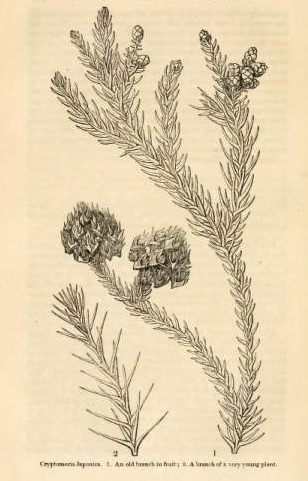 ‘The first account we find of the existence of this Japan Cedar is by Professor Thunberg, who, in the year 1784, published its history in his Flora Japonica, p. 265, under the name of Cupressus Japonica. He states that it is found, both spontaneous and planted, on the mountains of Nagasaki and elsewhere; that the Japanese call it San or Sugi, which, in their language, signifies an evergreen tree, with stiff bristle-shaped leaves; that it is a very tall upright tree, with a pyramidal head, bearing flowers in March; that the timber is very soft, so as to be easily worked, but much used for various purposes, particularly for cabinet work among the Japanese. Nothing further seems to have been added to our knowledge of this beautiful tree until 1834, when Professor Don published a more technical description, with an uncoloured plate, in the 18th volume of the Transactions of the Linnaean Society, under the name of Cryptomeria Japonica. His account was drawn up from the original specimen found in that portion of the Society's Herbarium which formerly belonged to their late President, Sir J. E. Smith, and which he obtained from the younger Linnaeus, who had it from his friend and successor Thunberg, after his return from Japan. Mr. Loudon, in his large edition of the Arboretum and Fruticetum Britannicum, merely mentions the tree under the old name, at the end of Cupressineae, upon the autliority of Thunberg, and in the last or abridged edition of the Arboretum Britannicum omits the name altogether as being very doubtful. No certain account regarding it appears to have been again given, from the time of Thunberg, until the year 1844, when Dr. Siebold, in his beautiful Flora Japonica, gave a coloured plate and a detailed account of it, from which I have made the following extracts. He says "that this majestic tree perfectly well deserves the name of Cedar, its name in Japan; that it grows from 60 to 100 feet in height, and 4 to 5 feet in diameter, with a pyramidal shaped head, and rather erect or horizontal branches; that it occurs in great abundance on the three great Isles of Japan, and most probably on the smaller ones; that a tenth part of the forests which cover the skirts of the mountains between 500 and 1200 feet of elevation, is composed of this Japan cedar." Still nothing was known of the living plants in England, or perhaps in Europe, until Mr. Fortune succeeded in obtaining seeds at Shanghai, in the north of China, for the Society. They reached the Garden in a living state, about the end of May, 1844, and from these the first plants were raised. Since that time an abundant supply has been received by the Society from the same source. Cryptomeria Japonica is found plentifully about Shanghai, where it no doubt has been introduced from Japan; for naval officers who have been on that station assure us that it is very plentiful in the form of avenues and in groves in the neighbourhood of Shanghai, and in the other northern parts of China, and that it furnishes the principal shelter for the numerous birds during the extreme cold and bleak winds in winter, when the thermometer sometimes falls as low as within 5 degrees of zero. There can be little doubt therefore that it will prove quite hardy in England. [JHS p.57/1846]. HIP vol.7 t.668/1844. Listed in the 1850 and 1857 catalogues [C.23/1850]. Obtained from Veitch’s Nursery, brought out from England by Captain P. P. King in 1849. Believed by Macarthur to be common before this or long introduced. It was also obtained from Kew Gardens and via Captain Simpson, source unknown, apparently in the same importation. [ML A1980-3]. A desideratum to Loddiges’ Nursery on 6th January 1845 requested Taxus japonica [MP A2933-2, p.28] but this is most likely a reference to Cephalotaxus pedunculata Sieb. & Zucc., synonym Taxus japonica Lodd. ex Gord.